The BOSS system is not a typical 1-2-3 system, it is a much more flexible concept. This allows you to find the perfect combination of creams & pads to address any specific polishing condition you come across. got to correct it. Best yet, these pads and creams are color coded. With 4 liquids, 5 pad types (and the Innerflex cushioning pad) in two sizes, you have hundreds of unique polishing combinations. If you are looking for a polish to remove light imperfections while leaving behind a durable layer of protection, pick up the Griot's Garage BOSS Finishing Sealant today! BOSS Micro Fiber Pads - Best used with the Perfecting Cream or Finishing Cream to remove light imperfections with ease. Formulated with a light load of sub-micron abrasives to remove mild blemishes and add depth and clarity. 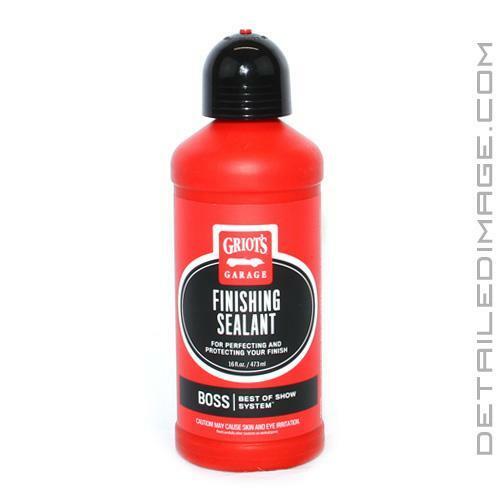 Our advanced formula BOSS Finishing Sealant is blended with premium polymers and waxes which offer durable protection. Directions: SHAKE WELL. Assess the surface, then select the appropriate BOSS pad. Thoroughly butter the full face of the pad. Working a 2' x 2' section at a time, spread product across entire area. Using light to moderate pressure and slow arm speed work product into surface for 3 to 4 passes. Remove residue with a clean micro fiber cloth. Apply 3 or 4 drops of product to pad and subsequent sections. Easy to use and works great. This really is an outstanding product. I have not used Griot's in years, as I have been mostly an Adams user and 3D speed for my AIO product. The Griot's product removed swirls and light defects easily from a few cars I detailed recently. It came off super easy and I am surprised how good it is. I used my Rupes LHR15 with lake county orange pads. This a outstanding product from Griot's. Really gives the finish an awesome shine. It does a nice job at finishing a rubout / detail and leaves no swirl marks. I will definitely continue to do business with your company in the future.